In the August 27, 2012 issue of Time, Rana Foroohar (2012) wrote about globalization. Foroohar asserted that globalization was originally all about creating a lop-sided benefit for companies and workers in the United States. On the surface, this is a rather parochial, if not absurd, concept. Foroohar, in effect, proposed that globalization’s purpose was economic colonialism, overcoming boundaries, borders, and barriers. The Levin Institute (2012) noted that international trade both causes and results from globalization. The proliferation and distribution of products from the United States is an example of globalization as is the availability of goods and services from Japan, South Korea, China, Germany, France, Italy, and Mexico. Trade negotiations effectively negated the consequences of any intended one-sided, eco-colonialism. Trade negotiations did not seem to reduce either exports or imports. Despite the economic downturn that struck most of the world’s economies in 2008, imports and exports since the beginning of globalization continue their upwards march, albeit with a noticeable dip in both imports and exports in 2008 and 2009. The assertion by Foroohar (2012) that globalization harmed the wages and upward mobility of workers in the U.S. would not seem to be related to a reduction of exports, as measured in dollars. Globalization seems to have increased exports and imports. 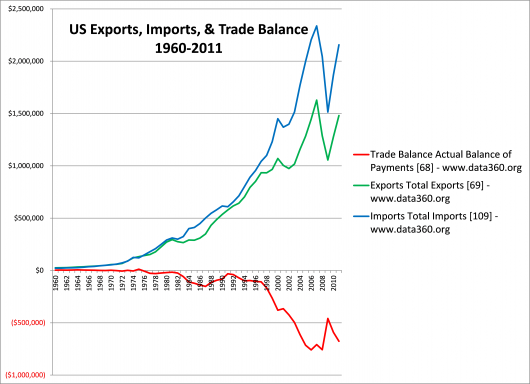 The detrimental phenomenon related to globalization, or not, is that U.S. imports have exceeded exports every year since 1975. The steady rise in exports since 1975, only dropping briefly in 2001-2002 and 2008-2009, would seem to have enhanced wage and mobility opportunities for workers in the U.S.. Similarly, the parallel rise in imports would seem likely to have had a corresponding influence on the economic well-being of workers in the countries from which the U.S. imports goods and services. Foroohar (2012) notwithstanding, perhaps the opportunity in the U.S. is not to somehow try to put the brakes on globalization, as if the U.S. is in control of such phenomenon, but to reduce the overall trade imbalance by taking steps through policy, innovation, and better management. Slowing globalization would seem to have the potential to reduce imports and exports; the objective should be to narrow or close the gap by some combination of continued growth in exports and a slowing of the growth in imports. Foroohar, R. (2012, August 27). The economy’s new rules: Going global. Time, 180(8), 26-32. Joseph Stiglitz, a Nobel Prize-winning economist, offered a rather narrow view of opportunity in a recent interview (Luscombe, 2012). Stiglitz seemed to propose that opportunity can only be measured by what people actually do with opportunity, by whether people improve their lot in life at all economic layers in the United States. Stiglitz proposed that other countries have surpassed the United States as the so-called land of opportunity; while this may be the case, as measured by upward mobility, is this truly a reflection of lack of opportunity or does it more accurately reflect comparatively lower levels of motivation or execution resulting in capitalization on those opportunities? Stiglitz raised a key factor in economic growth, which seems otherwise ignored, or at least under-considered, in the overall harm done to the economy if society either takes steps to restrict access to opportunities by economically disadvantaged people or does not consciously provide mechanisms to improve that access. Stiglitz asserted a artificial yet de facto restriction of access to the potential of people at or near the bottom of the economic ladder. I have long supported the premise that a key to sustainable improvement in business performance or the greater economy is to take strategic and tactical steps to raise the performance of those currently performing below their capabilities and capacities. On this point, I seemingly can agree with Stiglitz; however, even the best leaders cannot force people to do what they consciously or unconsciously elect not to do. Leaders, whether political, academic, business and organizational, community, or religious and social, can encourage, empower, and inspire people to live into their potential. The opportunity to live into one’s potential is an insufficient driver of realized potential. The unasked question is whether systematic or systemic barriers prevent the realization or whether something else may be going on? Stiglitz approached the unasked question when he offered that free markets, in reality, are a false premise because laws and regulations shape all, or most, markets so access to opportunity may be artificially, yet legally, constrained. If laws and regulations are constraining access to opportunity or it’s realization, then political leaders should take steps to identify those constraints and remove or change them. The people positioned to propose those changes are members of the so-called 1%, a term which Stiglitz also takes credit for first offering. Insufficient attention seems to get paid to the reality that a 1% will always be in a better position to do something than a 99%. We simply do not live in a society or world in which every is equal with equal resources, or equal power, or equal capacities, or equal potential. The labeling of people as members of “the 1%,” as if only one such strata exists, is also a false premise and is not necessarily or inherently a demeaning moniker. The challenge that is greater than a simplistic label or cry of lack of opportunity is to develop the societal will to examine the causes for unequal access to and realization of opportunity and potential. How do leaders help members of society at all economic levels understand and seek to live into their potential. What defines opportunity and potential for individuals, for groups, and for society? Once somebody identifies their potential, we may find that the next major hurdle is getting people to want to live into it. One of the biggest challenges I see as a graduate school professor land that I hear from my public school teacher colleagues is that students offer as a primary reason for not doing homework that they simply did not want to o it. Teachers cannot get students to work. Parents cannot or will not get students to work. Why should anybody expect the system to facilitate the attainment of a person’s potential when neither parent nor teacher nor, sadly, a large portion of students clearly demonstrate tat the will or the ability is not there? Luscombe, B. (2012, June 11). 10 Questions, Time, 179(23), 66. One of the sources of uncertainty about the global economy is the unsettled debate among leaders in Western Europe’s Eurozone about the use of monetary policy to solve economic problems. That debate rages in the United States despite rarely seeming to be framed in those terms. The downturn in 2008 was led by a liquidity crisis, a shortage of cash, that resulted from mythical wealth and cash from over-valued real estate. The real estate bubble resembled a grand Ponzi scheme without a Madoff-like figurehead to blame. The feared second dip is not a result of a crisis of liquidity but of confidence and uncertainty. Bruder (2011), writing about Egypt following their Arab Spring episode, observed that investors do not and will not pour capital into economic environments when the direction of the country is uncertain. In that regard, the current climate in the United States is similar to that of Egypt. Hough (2011) observed that publicly-traded U.S. companies, excluding financial companies, currently hold 12% of reported assets in cash, the highest reported level since 1954. Business executives are unwilling to release the estimated $1.2-2 trillion in cash on their balance sheets (Foroohar, 2011), and unknown amounts hidden offshore and elsewhere, until people in positions of leadership lead and re-establish certainty and a sense of confidence about fiscal policy, tax policy, spending policy, the deficit and whether to continue deficit-driven budgets, and what to do about companies and countries allegedly to big to fail. Compounding the uncertainty are conflicts and political turmoil seemingly around the globe and the limited recognition that the issue of debt extends beyond nations to states, businesses, and individuals. While the political debate in the U.S. capital seems to focus on taxes and entitlements, too little attention shifts to releasing some of the cash on corporate balance sheets. One reason for this may be the dearth of business understanding among elected representatives in both chambers of the U.S. Capitol. The cost of participating in three significant conflict zones sometimes enters the discussion and then seems to dissipate with the somewhat cynical recognition that all this military spending, on personnel and equipment, keeps at least that part of the economy moving. Debate rages in some circles about what the stimulus actually stimulated. Pouring a ton of cash into the economy logically had to stimulate something, but it seemingly didn’t stimulate as advertised. A review of the projects funded by stimulus money seems to suggest that, at best, the stimulus kept economic indicators from getting much, much worse than they got. On the other hand, very little money seems to have stimulated new spending; the stimulus may have simply enabled companies and universities to pursue projects already underway, and not cut them and their corresponding jobs. If, as Foroohar suggested, companies will not spend their cash in the United States even with more certainty, then perhaps policy gurus need to provide incentives for that cash to flow into domestic jobs and facilities. Foroohar, citing Nobel laureate Michael Spence, noted that evidence of companies outside of government, healthcare, retailing, and hospitality contributing to domestic job growth suggests the need for the paradigm to shift, yet public discussion of doing something new is lacking. Policymakers seem content to continue trying what they have always tried and somehow hoping for a different result; yes, that is what some define as insanity. Part of the new paradigm may need to include creation of jobs that allow people to work where they currently live. Such a policy would help people continue to make payments on homes until the housing market recovers. One of the challenges to developing this policy is that, as Foroohar suggested, alignment is poor between the skill sets of the recently and the chronically unemployed and the skills needed to fill 3 million current job openings and unknown yet-to-be-stimulated jobs from the new policies. Foroohar (2011), citing a Kaufman Foundation study, noted a decline in entrepreneurship in the United States since the 1980s, corresponding to the rise in the financial sector. Why? What will reverse this trend? Oddly, a Time article from the May 30, 2011 issue (Zakaria, 2011), apparently citing the same study, noted that small business yielded close to 100% of net job creation in the United States between 1980 and 2005. In the May article, the author recommended stimulating small business growth by facilitating basic research, re-engineering the patent, and presumably other intellectual property, processes, rationalizing regulation, and stimulating funding of new ventures. The May article recommended retaining more of the highly skilled immigrants trained in United Staes universities; a variation on this theme, consistent with a seemingly unrelated recommendation from the same author, is to provide the training needed to turn unemployed and underemployed residents of the United States into comparably highly-skilled workers. This does not need to be an either-or scenario; both are feasible as the approaches are not mutually exclusive. The May article (Zakaria, 2011) identified repatriation of manufacturing jobs and stimulus of production of “high-end, complex products,” retraining, growth industries, small business, and putting people back to work in interim positions to address near-term, dare I say “shovel-ready,” needs in the country as a long-term and near-term approach to the challenged economy. Good ideas, each of them essential to building the economy sustainably. Not only are they not mutually exclusive but they are also not operating in a zero-sum economic environment. Success of one does not detract from the success of other approaches and, if done right, they can be sustainably additive. Foroohar (2011) suggested the need for a national economic policy. Concerns by Republicans and Democrats about the concept may derive more from implementation and control issues than about the merits of such a policy. Perhaps out-of-the-box thinking is another area for which the backgrounds and education of our elected representatives has them prepared sub-optimally. Attorneys and politicians, the dominant backgrounds, prepares them for writing policies and laws, but not for being creative in determining the content or focus of those policies and laws. Sadly, as Scherer (2011) indicated, we are more likely to see political gamesmanship and handwringing than new policy before the 2012 election victors, whoever they may be, take office. While our elected officials in Washington, DC resume the pursuit of their primary obsession, re-election, after the seeming distraction of governing, the U. S. economy and electorate wait for somebody to lead. Voters in the United States, and especially business executives, seem to be watching elected representatives in Washington, DC to see if anybody steps up to lead before November 2012. Bruder, R. (2011, August 8). Jobs first, then peace. Why we shouldn’t give up on the Arab Spring. Time, 178(5), 22. Hough, J. (2011, August 27). Those safe havens you’ve been flocking to aren’t so safe. Wall Street Journal, 258(49), B7. Scherer, M. (2011, June 20). Grin and bear it. With the economy sputtering again, Washington has no plans to ride to the rescue. Time, 177(25), 28-29. Zakaria, F. (2011, May 30). A Flight Plan for the American Economy. Time, 177(22), 36-38. Since the current economic downturn began, roughly coinciding with the announced collapse of Lehman Brothers, pundits and politicians have spoken frequently of the need for job creation as an essential component of economic recovery. Creating work and creating jobs seem to be two different, even if related, objectives and outcomes. Creation of work implies a shorter horizon than creation of a china job. I create work when I identify one or more related or unrelated tasks for which compensation is appropriate for one or more individuals. Somehow a job implies longevity, if not comparative permanence, to the work. The tasks may be the same, but the duration differs. If I want to put people to work, I simply need to identify the tasks, the skill set, the appropriate compensation, and the funding source. If I want to put people to work, the only missing components are the identification of an available labor source and the hiring of a sufficient number of individuals from the identified labor pool. If I want to create jobs, I have a different challenge. For decades, employers have used automation and process improvement to reduce the labor content of their products and services. Some employers in some cases concluded that outsourcing or off-shoring certain jobs or functions had financial advantages that could yield financial advantages in the short or long term. In the interest of improved profitability or price competitiveness, employers made direct and indirect processes leaner with respect to labor and other resources. Now, the call goes out to create guangzhou jobs. This call is distinct from a call to provide work to those not currently working but desiring work. This call has an implied sustainability to it. So, employers, having dedicated resources to improving productivity and reducing labor content of products and services, now hear their elected officials promising to create jobs. As an employer, I can create jobs if I agree to reduce my profits or I can create jobs if the demands in the market exceed the capacity or capability of my workforce. The market either tells me it needs more of my existing goods or services than I can provide with my current workforce or it needs goods and services that I cannot currently provide with my current workforce. The issue of reduced profitability may find resolution in government incentives, likely either tax benefits or direct stimulus money for hiring. A demand-driven solution seems much more difficult to implement, even though it is probably more sustainable. A demand-driven solution requires a change in the markets for goods and services. A government funded economic stimulus package may need to provide short-term incentives to create jobs coordinated with demand-side stimulus to stimulate the market for goods and services. Do policymakers act as if they understand this? In the January 25, 2010 issue of Time, Nina Easton questioned the advisability extending jobless benefits indefinitely. Ms. Easton suggested that allowing eligibility for periods approaching two years may extend unemployment while providing a modest cushion to the unemployed who would prefer to be working. Ms. Easton’s article raises in my mind the question of the extent to which jobless benefits and job creation and economic stimulus are, and should be, synchronized. Why is nothing said about creating sustainable jobs in sustainable new ventures that have two special objectives in addition to those you would find in most business enterprises: meeting an acknowledged need in the community and providing long-term employment to the chronically unemployed and under-employed? The official jobs created data at Recovery.gov is categorized as recipient reported or agency reported. Recipient reported data is categorized as contracts, grants, and loans. Agency reported data is reported by ten individual departments: CNCS, DHS, DOC, DOD, DOE, DOI, DOJ, DOL, DOS, and DOT. As of 12/31/09, the federal government’s various recovery programs reported 20,368 contracts, 203,010 grants, and 986 loans. Of the 20,368 contracts, 9,225 contracts provided no indication of jobs created and 1,437 (12.9% of the 11,143 and 7.1% of the total) that did provide job creation figures indicated fewer than 0.5 jobs created as a result of the contract. The 20,368 contracts totaled $25,081,315,704 in federal government funding to create 33,941.1 jobs for an average of $ 738,965.91 per job. The 5,310 contracts reporting 0.5 jobs created or more totaled $15,501,184,696.22 in funding and 33,684.4 jobs created for an average of $460,188.83/job while the 1,437 contracts reporting less than the equivalent of one-half of a job created received $855,094,999.83 in funding and created 256.7 jobs for an average of $3,330,976.59/job. Of the 203,010 grants awarded (totaling $ 220,867,140,623.89), 53,941 grants (totaling $149,614,773,566 and 563,212 jobs created) provided job creation figures of which 23,719 (44.0%of those reporting job creation data, totaling $ 30,354,378,833.84 in funding) indicated zero as the number of jobs created. Of the grants reporting job creation data, 6,031 (11.2% of those reporting, totaling $5,941,548,974.86 in funding) indicated less than one-half of one job created by the grant. The 24,191 contracts reporting one-half of one job created or more totaled $ 113,318,845,757.34 in funding to create a reported 561,911.39 jobs for an average of $ 201,666.75 per job. The 6,031 contracts reporting less than the equivalent of one-half of one job created reported 1,300.86 jobs for an average of $4,567,400.78 job. Of 986 loans, 10 (1.0% of the total) indicated fewer than 0.5 jobs created as a result of the contract. The 986 loans totaled $ 2,279,583,561.04 (average of $2.3 million per loan) in federal government funding to create 1,955.07 jobs for an average of $ 1,165,985.65 per job. The 125 loans reporting 0.5 jobs created or more totaled $ 759,306,200.00 in funding and 1,953.64 jobs created for an average of $388,662.29/job while the 10 loans reporting less than the equivalent of one-half of a job created received $ 96,133,000.00 in funding and created 1.7 jobs for an average of $ 55,248,850.57/job. Out of 224,364 projects funded through 12/31/09 as part of the Economic Stimulus (Recovery) program, 158,294 projects (70.6%) did not report job creation data, 28,966 projects (12.9%) reported no jobs created and 37,104 projects reported at least fractional job creation. The funded projects received a total of $ 220,867,176,520.38 creating a reported 597,288.36 jobs for an average of $369,783.16 in funding per job created. An unknown portion, possibly a large portion, of project funding was budgeted for non-personnel costs. By comparison, Ford Motor Company with a market capitalization of approximately $36.5 billion employs 198,000 employees as of the end of fiscal year 2009 (Microsoft has a market capitalization of $245 billion with 93,000 employees). It seems that the economic stimulus projects, as currently reported, may be expensive compared to Ford (less expensive compared to Microsoft) on a per-employee basis, especially when one considers that many of the created jobs appear to be short term. The key consideration is whether the jobs created are sustainable or temporary. If the jobs are temporary, federal and state government policy makers should consider shifting some unemployment resources to fund temporary jobs that may require less extensive pre-employment training and dedicate more resources to fund sustainable jobs of the future. Policy makers need to coordinate with industry, local, and regional planning bodies to identify long-term needs in their industries and areas, educational needs associated with those long-term needs, and develop plans for sustainable, in-demand job creation to phase-in and replace some of the current stimulus funding.